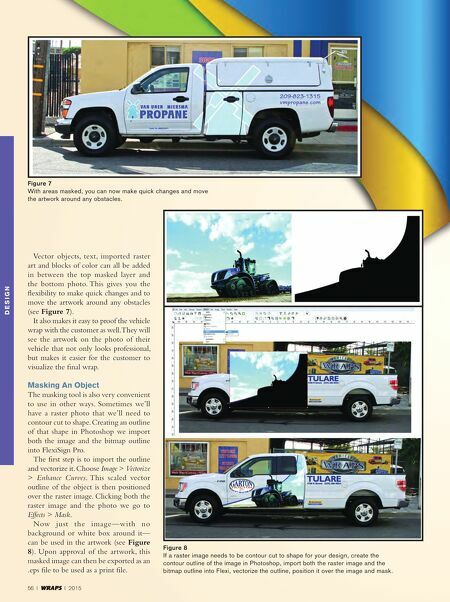 2015 I WRAPS I 57 Seamless Setup If we're designing a wrap in FlexiSign Pro and we want to use the natural bodylines of the vehicle to create our panels (to avoid seams), we'll use the Mask tool to manually create the print panels (see Figure 10). It's easier to create the panels in Flexi than in the RIP software. We use the rulers to define the areas on the vehicle that have a natural break. Because you'll be overlapping the artwork from one panel to another you have to copy and paste the artwork multiple times. 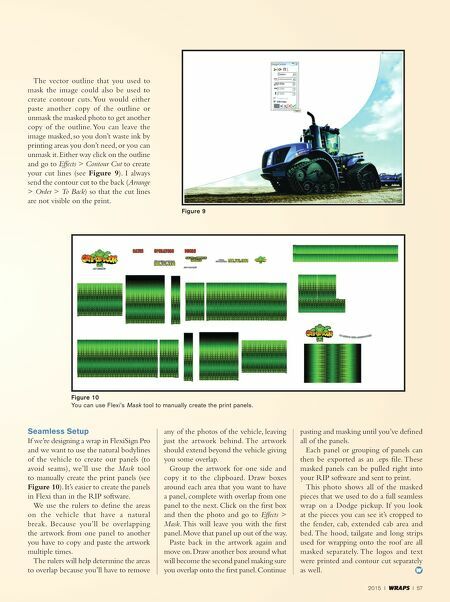 The rulers will help determine the areas to overlap because you'll have to remove any of the photos of the vehicle, leaving just the artwork behind. The artwork should extend beyond the vehicle giving you some overlap. Group the artwork for one side and copy it to the clipboard. Draw boxes around each area that you want to have a panel, complete with overlap from one panel to the next. Click on the first box and then the photo and go to Effects > Mask. This will leave you with the first panel. Move that panel up out of the way. Paste back in the artwork again and move on. Draw another box around what will become the second panel making sure you overlap onto the first panel. Continue pasting and masking until you've defined all of the panels. Each panel or grouping of panels can then be exported as an .eps file. These masked panels can be pulled right into your RIP software and sent to print. This photo shows all of the masked pieces that we used to do a full seamless wrap on a Dodge pickup. If you look at the pieces you can see it's cropped to the fender, cab, extended cab area and bed. The hood, tailgate and long strips used for wrapping onto the roof are all masked separately. The logos and text were printed and contour cut separately as well. The vector outline that you used to mask the image could also be used to create contour cuts. You would either paste another copy of the outline or unmask the masked photo to get another copy of the outline. You can leave the image masked, so you don't waste ink by printing areas you don't need, or you can unmask it. Either way click on the outline and go to Effects > Contour Cut to create your cut lines (see Figure 9). I always send the contour cut to the back (Arrange > Order > To Back) so that the cut lines are not visible on the print. Figure 9 Figure 10 You can use Flexi's Mask tool to manually create the print panels.